Believe it or not I woke up at 7 this morning to a gorgeous sunny day, so I hustled out to Hyde Park and Kensington Gardens to take advantage of the sunshine. Spent a few hours walking around/getting lost. I found my way to Kensington Palace, the former home of Princess Diana. I wandered the gardens for a bit but decided not to make the trip inside yet; it cost money, I had a river cruise appointment, and a lot of the palace was under construction so I'm still not sure if I want to make the trip yet. What has been a bit frustrating with London is that in preparation for the Olympics, a lot of things are closed/under construction until 2012. I bet London 2013 will be a great time to visit. I made my way back to Westminster a little bit early, so I went back to take more pictures of the Houses of Parliament and Big Ben with blue skies. This woman accosted me as I was heading up the steps from the Tube by sticking a fake flower in my shirt saying she was for the Save the Children's charity, and would I like to make a donation. I figured I'd throw a coin her way, but then she said, “Paper please. Most people make donations of 10 or 20 pounds.” I couldn't see my face, but I'm sure it looked like one of the most skeptical faces ever made by a human being in the history of time. I said, “Sorry,” and tried to walk on but she continued saying, “It's our last day. I can break a bigger bill if you need to.” I said, “Sorry,” again and walked on and she actually followed me. I was this close to asking if she wanted her plastic flower back, but she finally left me alone. The whole deal left me annoyed; I kind of wanted to run into her again on my way back but it's way too crowded and I'm not going to give American tourists a bad rep by getting in stupid arguments in front of everyone. Relentless wench! It was similar to how the reception at my hotel accidentally swiped my credit card when I arrived (even though I had prepaid), and making a big deal about my wanting to remove it because it was only an authorization and they wouldn't actually charge me. And then she said it would take 48 hours to cancel and blah blah blah until finally after she had asked twice I said, in my normal, sweet (not really) voice, “Take. It. Off.” It could be that London has so many tourists, but so far I'm not getting the same type of hospitality that I got in Canada or New Zealand. I booked a cruise 2 days ago on the London Eye for today after seeing that the weather was going to be good today, and walked around that area until I got harassed too many times by more people trying to get money, either by dressing up or trying to make something for you. I think my big camera gave it away, so a word of advice, if you are in that Westminster area of London, near the London Eye, it is a tourist booby-trap and I hope you either have a lot of cash or you're willing to be a jerk to people you will never see again. The London Eye Cruise wasn't that bad; it gives you a good view of the important buildings along the Thames. I would have gotten more out of it if I hadn't gone to see those places on foot already, but the breeze was good and the sun was shining so it was a nice little boat ride. 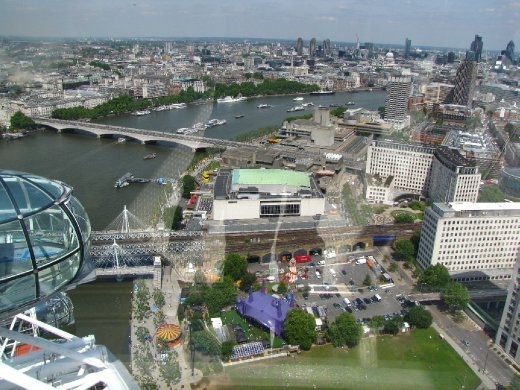 The London Eye itself, if you didn't know, is basically a gigantic Ferris wheel. They don't call it that of course, but that's pretty much the gist. You stand in a big glass capsule and it takes half an hour to make a complete loop. Luckily today the visibility was good, although the sun really heated up the capsule. I went to the 4d experience afterwards, which was basically a 4-minute 3d promotional video of some of the buildings around the London Eye, while you get sprayed with water in the theater while Coldplay is blasting on the speakers. Yes, totally cheesy, but I'm all for cheese. Afterwards since I was already in the area, I went back to Westminster Abbey... and actually got inside! Thank you, Rick Steves! Afternoon is definitely the right time to visit. There was no line at all so I was afraid it was closed but 3 p.m. seems to be the perfect time. Anyways, no pictures or videos allowed obviously. In the end I'm glad they don't allow that because people would be stopping all over the place, clogging up areas and probably trying to do stupid stuff in front of the tombs. But I'm sure you all saw at least pictures of the Royal Wedding so you have an idea what it's like. It is massive though, something that doesn't get conveyed that well on the television. Ceilings are incredibly high (made possible through the use of flying buttresses per Rick Steves), and you don't get the feel for how old the church is until you actually walk inside. As far as just the experience of exploring, I preferred St. Paul's since it's not as crowded and you aren't funneled through the church like it's a Disney ride. After Westminster I decided to take a lot of detours and spend a lot of time walking so I could get to Millennium Bridge... so I could walk across it. The bridge design is interesting and it's nice to have a pedestrian-only bridge, but I don't know if it's a trip highlight. I made my first stop to one of London's public toilets on the way, where you have to pay 20 pence and the whole booth flushes and sanitizes after you leave. It's better than a port-a-potty but I had this irrational fear I was going to be trapped inside while it desanitized since the doors work automatically. Finally I decided to cap off the day with a visit to Harrod's – the gigantic department store. I've never felt so underdressed visiting a department store in my life. And I was wearing my nicer clothes today. The layout is definitely not something I got used to; rooms lead to other rooms which lead to other rooms. It's like the video game Gauntlet (for you geeks out there). I wound up eating dinner there too at the Pizzeria. You just sit down at the counter and they make your pizza in front of you with the wood-fired oven. There were 2 girls sitting next to me who shared a pizza, so I felt like a pig for ordering a whole calzone for myself. But I couldn't get any smaller portions unless I wanted a salad. Yeah, who's going to order a salad as a meal on a vacation? I couldn't finish the whole thing, but maybe that's because I also had ordered this expensive fruity lemonade fizzy drink, which was also excellent. Then right at the dot at 7 p.m. they started blasting Michael Jackson music; I haven't used my iPod at all during this trip, but hearing all of Michael Jackson's greatest hits while shopping in London felt strangely appropriate. I have no idea what I'm doing tomorrow. I just checked the forecast and it looks like rain for the rest of the time I am here, which stinks, but that means I'll be able to spend a lot of times at the museums. I've been getting tired walking around, and I am using great self-control not to take the lazy route and hop into Starbucks every time I need a drink (a sweet, delicious drink), and it's only my 3rd day in London. I had to make a special effort to pass 2 Starbucks today so I could order a green tea fruit smoothie at a place called Tea – which I don't even know if it's British - but I have to try new things here! It's okay to push people away in London. A crazy lady followed me and Brad while we were at an outdoor market. When she tried to touch me I slapped her hand away. Glad that you are having fun! Wow, you've been covering a lot of ground. Re: the Princess Diana palace in Hyde Park, it's mostly dresses with life size pictures next to them (of her wearing the dresses). The rest is just modest royal rooms. I'd skip it.